The expert committee of Abhay G Bhatt, head of ISI Centre in Delhi, Rajeeva L Karandikar, Director of Chennai Mathematical Institute, and Onkar Prosad Ghosh, Deputy Director General (Social Statistics Division), Central Statistics Office, Ministry of Statistics and Programme Implementation, submitted its report to the EC last week. As reported by The Indian Express on March 24, the report recommends an absolute number of polling booths that should be sampled to test the accuracy of EVM results, instead of a fixed percentage or proportion of all polling stations in an Assembly/ Lok Sabha constituency. Follow more election news here. “The final report has suggested two alternatives, each of which is an absolute number of polling stations. The Commission is already doing a lot more than what has been recommended by the committee,” said a source, who did not reveal the exact sample number suggested by the committee. 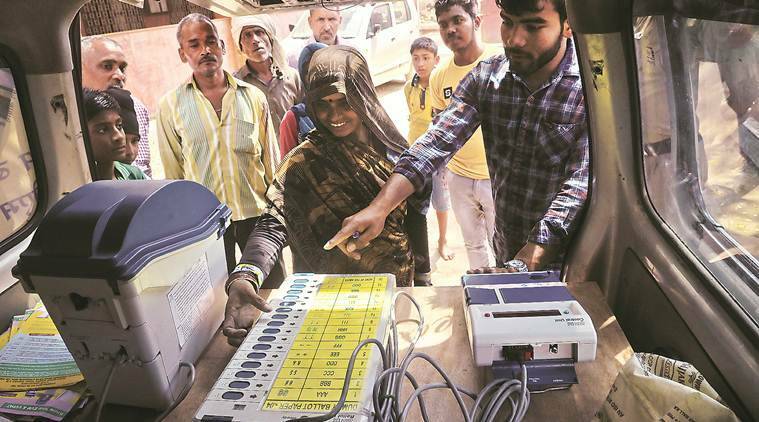 In a presentation made in August last year to the then Chief Election Commissioner O P Rawat, Karandikar and Bhatt had suggested that mandatory counting of VVPAT slips in a sample size of 479 randomly-selected polling stations across the country should be enough for the EC to satisfy itself — with 99 per cent confidence — regarding the integrity of the elections. However, it’s not clear whether a sample size of 479 polling stations is one of the two alternatives suggested by the three-member committee last week. The EC is likely to mention the findings of the report in its affidavit that has to be filed in the Supreme Court by March 28. The apex court is currently hearing a joint petition filed by 21 Opposition parties demanding random verification of EVM count in at least 50 per cent of polling stations in every Assembly/ Lok Sabha constituency. At the last hearing on Monday, the Supreme Court told the EC that it “would like” the poll panel “to increase” the number of random checks of VVPAT slips from one polling station per seat. It also asked the Commission whether it would face any difficulty if such an order was issued. The matter will be taken up next on April 1.